KIEV, Ukraine -- One year ago, Malaysian Airlines Flight MH17 was shot out of the sky over the war zone in eastern Ukraine, and one year later we are closer than ever to proving who is ultimately responsible for this tragic act. A pro-Russian separatist holds a stuffed toy found at the crash site of Malaysia Airlines flight MH17, near the settlement of Grabovo in the Donetsk region, July 18, 2014. I have been compiling and analyzing information gathered over the last 12 months by field reporters and bloggers, statements from the Russian and Ukrainian governments, and the investigations launched by various government and non-government agencies, including the official inquiries of the Dutch Safety Board. The goal is to find and address similarities and discrepancies, and to use new information to verify or debunk parts of the narrative put forth by either the Ukrainian or Russian governments. One theme struck me — just how well eyewitness testimony, the investigations of many journalists, videos and pictures uploaded by citizens of Ukraine, and even the intelligence assessments of the Ukrainian and Western governments all dovetail together with, ironically, the initial statements of the Russian-backed separatists in Ukraine to form a more complete and largely-harmonious picture of what happened that day. For instance, within minutes of the aircraft being shot down there were already videos, pictures, and social media reports of the burning wreckage. But at this point, no one knew that a civilian airliner was missing. Instead, the assumption was that the Russian-backed separatists had shot down another Ukrainian military aircraft, one of many destroyed in the weeks leading up to the downing of the civilian airliner. 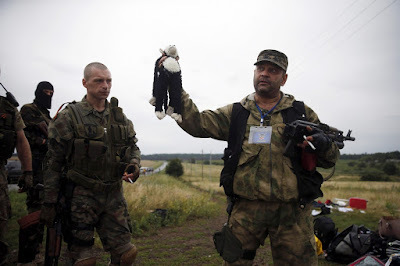 Within hours of the crash, as the world learned that a civilian aircraft, not a military one, had been shot down, the separatists worked to hide their previous statements while citizens of eastern Ukraine and journalists who were positioned in the area furiously uploaded pictures, videos, and eyewitness reports — pieces of a puzzle which clearly indicate that those initial statements by the leaders of the Russian-backed fighters were accurate, the pro-Russian separatists were indeed responsible for the shooting down of a civilian airliner. The supporting evidence for this claim is overwhelming. Arms experts quickly realized that the anti-aircraft missiles which the Russian-backed fighters were known to possess were not capable of hitting an aircraft at MH17’s altitude. But with the fighting in eastern Ukraine building to a crescendo, the area was crawling with war correspondents, and journalists for the Associated Press witnessed the prime suspect in this disaster, an advanced Buk anti-aircraft missile which had not previously been documented in this conflict. Pictures and videos showing the Buk in various locations in near the crash zone were also uploaded by citizen journalists, as experts such as myself worked to confirm the locations shown in the citizen reports. Eyewitnesses overheard in videos and interviewed by journalists talked about a missile which was fired somewhere south of the town of Snezhnoye which hit the aircraft. A photographer in the area, not far from where the Buk was believed to have been launched, photographed a smoke trail ascending into the sky. Citizen bloggers were able to determine where the picture was taken by comparing the topography in the picture with satellite photos and geotagged pictures. Journalists then traveled to these various locations, interviewed residents, confirmed the location of pictures, and were able to piece together a convincing timetable for where the Buk had traveled before, during, and after MH17 was shot down. The broader question, though, is whether the Russian government is ultimately responsible for this tragedy. As my full report points out, there is evidence that the Buk traveled from Russia before MH17 was shot down, and there is even better evidence that it returned to Russia after MH17 was shot down. The report also links to evidence that the same Buk which shot down MH17 was documented in a Russian military convoy on the Russian side of the border before it was spotted in the area of MH17’s crash site. But while stories about anti-aircraft missiles and Russian conspiracy theories have received plenty of attention, forgotten in some analysis of MH17 is the wider context. In the two months that led up to MH17, the fledgling Ukrainian government, perhaps confident that it had a public mandate and did not face a counter-revolution, was doubling-down on its efforts to reunify the country. The Russian-backed fighters were rapidly losing territory to the Ukrainian military throughout late May, June, and early July. It was during this period that a large influx of new weapons reached eastern Ukraine, weapons which had no clear point of origin and many which had not been seen on Ukraine’s battlefields. The Buk was just one of these weapons, though perhaps the most significant, and its presence in Ukraine that day was part of a wider pattern of expanded Russian military involvement in the Donbass.